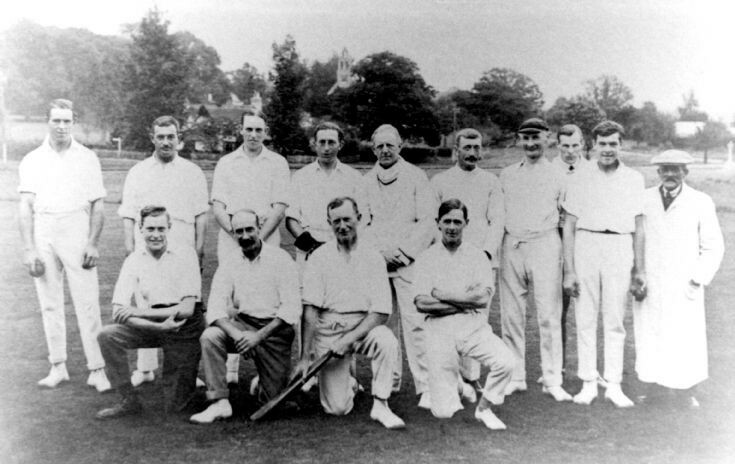 This faded photograph is of Staplefield cricket team posing on The Common with the war memorial on the extreme right and the church in the centre. There are no further details attached to the photograph. On 19th May 1956 Staplefield welcomed Warninglid to a match on The Common; the return match at Warninglid being scheduled to take place on 5th August. For persons using the search facility the players are named here, in batting order. Staplefield: Mike Honey, Joe Ray, Sam Farmer, John Dyball, Roger Ray, Charlie Pennifold, George Prevett, Rex Ray, Ron Pateman, John Robins, Bill Stockton. Warninglid: E. Turnville, J. Godsmark, C. Kent, Tony Hemsley, Rob May, F. Tingley, P. Griffiths, H. Rusden, B. Woolven, P. Hemsley, M. Mitchell. Worth mentioning are John Robins's bowling figures of 10 overs, 7 maidens, 4 wickets, for 3 runs. Click on Open Document to view the match statistics in the score book.